A saved reply is a snippet of text that can be quickly added when chatting with a customer. Using saved replies is a great way to tackle issues that require a standard or simple response. Don't see the option to edit or delete saved replies? An account Admin or Account Owner may need to adjust your company's User permissions. See more on that here: Change User roles and mailbox permissions. You can create saved replies from scratch via the mailbox Settings page or while your chatting with customers. Both the Account Owner and Administrators can create and edit saved replies, while Users will need to be given permission. See more on that here. Give your new reply a name, then compose your reply in the chat content text editor. From this screen, you can create a reply for use in chat or email conversations only, or a reply that includes both a chat and an email version. You can also create new saved replies directly from the chat interface. If you've typed up a response that you think you'll use again, simply enter the /saved slash command after your reply and click Create Saved Reply. Next, give your reply a name and create the email version of the reply (if needed), then click Save Reply. If you have existing saved replies in your account that were created for your email conversations, you can easily create the chat version of those replies from the mailbox Settings page or from any active chat. By default, existing email replies will not be chat-ready. Search for or scroll down to find the saved reply you'd like to edit, then click on the name to open the content editors. To copy the email content as is, click Copy email content. Variables and line breaks will be kept in your reply. HTML, pre-formatted code, and inline images will be removed, and any URLs will be re-formatted. Ex: Help Scout (http://helpscout.com). You can also click Start from scratch to open a blank chat content editor. Existing email replies can also be converted for chat from the chat interface. 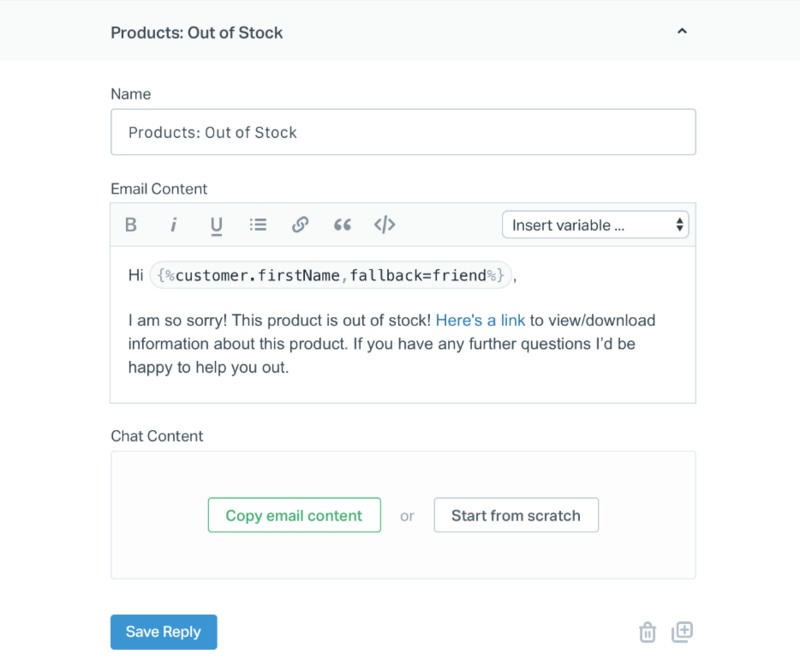 If you come across a saved reply that's not chat ready, you'll have the option to create the chat reply or reply to your customer using the existing email reply. To insert a saved reply into an active chat, type the /saved slash command or click the ... icon and select Saved Reply to open the saved reply search bar. Saved replies are organized in alphabetical order by name. To learn more about how to organize your saved replies, see this article.